The extra judicial killing of Mohammed Yusuf, leader of “Boko Haram” the Islamic extremist sect in Maiduguri, continues to attract criticism, particularly , Navi Pillay, the top United Nations human rights official, who expressed deep concern over the clashes in Nigeria and called on the Nigerian government to investigate and bring offenders to justice. In a media advisory issued in Geneva, Pillay said she hopes the government "makes every effort to achieve security with full adherence to legality and respect for human rights,"
As soon as Pillay`s statement was available, President Yar`dua who left the shores of Nigeria, while the mayhem escalated ordered an investigation into his killing, while under police custody. Huhuonline.com checks reveal that President Umaru Yar'Adua has also ordered the national security adviser to arrange a post-mortem on Boko Haram leader, Mohammed Yusuf. Recall that the national security adviser was the arrow head in the arrest of publishers of Huhuonline.com and Elendu reports last year in Nigeria. As Huhuonline.com previously reported, Mohammed Yusuf was killed on July 30 after he was found hiding in a relative's goat pen. Nigerian Police said Yusuf was killed in a gunfight; however this claim has been disputed by the arresting officer who said “I personally arrested Yusuf and turned him over alive to authorities”. 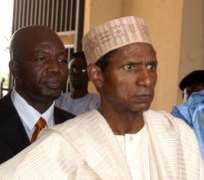 President Umaru Yar'Adua said that Yusuf's death was a serious issue and he hopes to get the post-mortem report by the end of the week. "This is an incident that will be investigated, together with the overall events that have happened," Yar'Adua said. "I directed the national security adviser to carry out a post-mortem with the security agencies as a first step so that we can have a full report of what has happened during the crisis including how the leader of the Boko Haram was killed, and the circumstances under which he was killed,"
Huhuonline.com gathered that prior to the mayhem, moderate Muslim clerics and scholars had warned government officials about the sect's violent tendencies — and those alarms went unheeded before Boko Haram militants attacked a police station in Bauchi state on July 26. Violence quickly spread to three other states before Nigerian forces retaliated, storming the group's Maiduguri compound. Earlier, Nigerian police high command who invited journalists to view Mohammed Yusuf's tattered corpse on July 30, averred he was fatally wounded in combat. Nevertheless Army Col. Ben Ahanotu said he personally arrested Yusuf and handed him over alive to police.